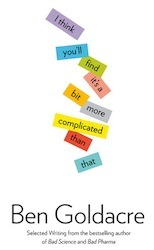 "I think you’ll find it’s a bit more complicated than that…" and other excellent Christmas gifts. It’s cold out there, why would you go shopping when you could just click here and have at least a third of your festive gift requirements sorted in five minutes, from the comfort of your very own springy buttock cheeks? First up, much awaited, we have possibly the finest all-purpose political t-shirt slogan ever conceived. Better still, they only reveal their true powers when you are standing next to someone who is also wearing a slogan t-shirt. Recent favourites from my bus journey include “Drop beats not bombs” and “I need a hug”. Post links below to pictures of you wearing your “I think you’ll find it’s a bit more complicated than that” t-shirt in amusing situations, or email them in, and the best will win a genuinely amazing secret prize. Also available in girly pink, where the slogan will interact cleverly with your breasts. All this interactive christmas comedy pleasure for just £11.90 / £12.90. A confrontational baby bib is both a public health intervention and an opportunity to have discussions with morons about what safe “really means”. Ideal for childrens parties in affluent middle class areas, but best of all this bib is organic so it won’t give your child eczema, or the Aids. £13.90 I’m afraid, which I agree is ridiculous. I don’t set the prices, I just upload the images and get a 2 quid commission or something. You are glad to give at christmas. The miracle of intellectual evolution goes into a juddering reverse, as we take anxieties about globalised capital and mass industrialisation out on our bodies by pretending that empty sugar pills can cure everything from TB to cancer. T-shirt design by Twm Davies, designer of the excellent Now Clock, which would be great if it wasn’t in crap chrome. 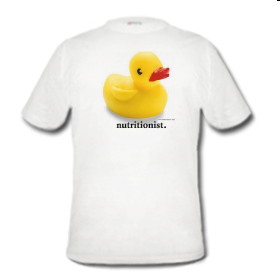 The original and best nutritionist t-shirt, ideal for the nutritionist in your life at christmas. Also gratifyingly popular with militant dietitians and academics who study the science of nutrition. If we sell more than 50 items this Christmas – which is highly unlikely – then I will personally start handing these out to actual genuine Russell Group university professors of nutrition research. If anybody techy wants to convert my crappy .jpeg files into vector files which are “.eps, .ai (up to version CS2) or .cdr (up to version 11)” – whatever the hell that means – then the whole range will be available on coloured t-shirts too. Don’t hold your breath. Lastly, of course, I can recommend my book as the ideal all-purpose christmas gift for the nerd or quack in your life. It’s a proper book, rather than a compilation of columns, which is why it was delivered three years late, and the most gratifying chatter I’ve seen around the internet has been people saying “hey this is pretty good, I’m totally getting one for my nerdy dad, and one for my flaky sister who quietly believes in homeopathy and didn’t give her second kid the MMR vaccine”. That’s right, Bad Science is the gift of goodwill that can be given in frustration as much as in love, and it’s touching to think that through this blog we might be contributing to family arguments the length and breadth of the country at christmas. They will be conducted at a far more nourishing level if you’ve both read the book. Of course in the Bad Science Amazon Store you will find lots more excellent books including Irrationality by Stuart Sutherland and more. Hurrah and merry xmas! Spotted one of your ‘MMR is safe’ bibs in the Science Museum (Wellcome gallery I think). Sure would be nice if your book were being sold on the Canadian (or American if you insist) side of the big wet bit, aka the pond for people who are trying to sound clever and formerly British. I bought it from amazon.co.uk, but the shipping was a bit painful. I love your book, shame i cant think of anyone else around here who would like it, or needs it. Goodwill to all men at Christmas time and all that. I’ll send an SAE. Couldn’t we have a women’s version that *isn’t* pink? Any other colour and it’d be on the top of my Christmas list. I’d buy the ‘homo-eopath’ T shirt for Simon Singh if he wore it in his defence against the legal action brought by the Society of Homeopaths. A picture says a 1000 words….. I LOVE the “complicated” ladies fitted tshirt, but the colour is appalling. Can we get it in black? I’d be whipping out the credit card right now if it were in black. My partner and I have come to the conclusion that there is only one Law of Science (esp. biology), and that it’s Always More Complicated Than You Think. I ordered two copies of your book (one for me, one for a Christmas present). Despite the v. bad cover. Have been in shock ever since I realized I was going to pay more in postage than I was for two copies of the book. Next time I’ll just send you a plane ticket and you can fill a suitcase with them. Then I’ll flog them on the street to recoup the cost of the plane ticket. 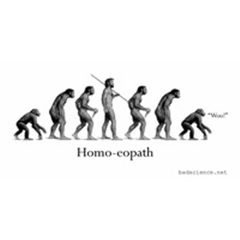 Do love the homo-eopath T-shirt but I’d be lynched if I tried to wear it in Vancouver. blackjackshellac and anyone else not in the UK: have a look at www.bookdepository.co.uk, with free delivery worldwide. Whoops – you might want to delete my comment above – its the chiropractors sueing Simon Singh not the homeopaths! When is stem cell research going to be in a position to sort out my memory? I’m waiting for the sale..
Its taken me so long to save up for that bib that my baby no longer needs it! the book’ll be out in the US in about 6 months probably, just had an offer. they want it changed quite a bit and they don’t think anyone’ll buy it there, i might ask for advice on changes for US audience in new year. bit worried people might buy the US version by mistake and be disappointed to find holford etc missing. mckeith is on bbc america i am pleased to see. hohum. note: 6 – six! – tshirt/bib/other orders in the shop so far. w00t! Not to worry Mike – expect it’s waiting for moderator to approve it! just tried it myself, a message came up saying, “thank you for your comment we might not be able to post them all because of the volume we recieve.” i think i should mention that iv seen other newspapers website deleting and censoring comments because they were critical of the story, E.g. the daily mail deleting comments that pointed out that their pictures of “terrorist plans” were actually from a videogame. i wouldn’t put it past the times to purposely ignore comments that are critical of this vaccine story. Thanks to daphna re www.bookdepository.co.uk link – I ordered through this site because I thought Dr. Ben needed the extra revenue to pay for his podcasting gear, etc., but the huge US advance he’ll get should solve that problem. Oh it will sell in North America although given recent polls re American attitudes to nanotech the controversy it will generate will fuel the sales. I’d recommend taking on the organic food industry (which includes the promotion of non-pasteurized milk), the anti-fluoridation lobby, the anti-mercury fillings fear mongerers and the opposed to x-rays crowd. Please, please, not pink. I could just about stand a black t-shirt with pink marabou lettering, but even that’s going a bit far. What is it with this pink culture anyway? Are women supposed to have different retinas? Or no taste? I’d like a pack of disposable Occam’s Razors. Just like to say to anyone who read my last post, i take some of it back, the times has posted my comment (spelling mistakes and all, bugger) and one other comment criticising the story, no doubt theres probably a bit of bias in their decisions but atleast their not afraid of some criticism. Highly offensive music to play on the train/bus/tube on the speaker of your mobile phone in the way that kiddies do with their R’n’B type stuff. Wow, extremely powerful speech at 8 songs last night Ben. You guys are going to raise an army. Given that you covered the whole blue/pink gender issue a while back, I’d at least have expected you to do a pink men’s shirt. OK, (almost?) everyone who saw it would likely leap to the wrong conclusions; but it’d be very very meta. Just bought the homo-eopath T shirt. How come you have to pay in Euros? Now my bank is going to fleece me with a foreign currency transaction fee, the bastards! Still, worth it though. Another request for a colour other than pink please – black or navy would be great. I bought Bad Science and wrote a review of it here. I didn’t buy it for anyone else although I might lend it to my doctor friend. I’m not sure if the people I know who are into homeopathy are interested in scientific refutations – it works for them and that’s all they want to know. Some of them are into NAET – have you anything on that? Shouldn’t the bib read: “mmr hasn’t been proven to be dangerous (yet)” ? Why no organic cotton option for the Tshirt? Why such crap colo(u)rs? I got the plain white one with its little black letters and, while the text is the perfect sentiment for the age, the really basic aspect of the manufacture seems a bit low-budget. There are on-demand t-shirt manufacturers that give you a huge range of choices like CafePress.